Once you get your membership site up and running, you’ll need to stay on a weekly maintenance schedule to add new content to your website, promote it and promote the affiliate program. Fortunately, there are just a few simple steps that you need to take on a weekly basis to keep your membership site moving along. This should be your top priority because it helps you hold onto your existing customers. One dissatisfied customer can make you lose out on a whole bunch of future customers. Try to get to this at least twice a week so you can respond promptly to their inquiries. Most membership scripts will require you to manually remove canceled members from the database. Take care of this quickly each week so that you won’t have people getting into the site for free. This is a given. Your members are paying for fresh content delivered each month. Rather than have them wait all month for a new update, split up your monthly delivery into four different parts. This way there is fresh content for the members to see each and every week. An editorial calendar will help you stay on track and keep your customers satisfied. If you have a forum as part of your membership site, be sure to check in several times a week to stay on top of important threads and respond to questions from members. Be present and your members will see that you are dedicated to helping them. Your membership site’s success depends on giving the members exactly what they want. You can keep your finger on the pulse of the market by offering a weekly poll. Ask them about their favorite parts of the site, what they’d like to see next, and their worst problems with the topic or any other information that you’d like to know. If you do this on a weekly basis, the members will look forward to participating and give you tons of valuable feedback. Toward the end of the week you should send a short e-mail newsletter to your subscribers to let them know what happened in the site. Many times people will sign up for a membership site, forget why they did it and then unsubscribe a few months later. With an e-mail newsletter, you can remind members of what is going on within the site and encourage them to come back, see the new content and get involved. Your membership site won’t grow unless you promote it. Article marketing is a powerful way to drive traffic to your site and brand yourself as an expert in your niche. At the beginning of every month, brainstorm a list of four to six different topics that you’ll write about that month. Write one to two articles per week and then distribute the articles to a few key article directories. The whole process won’t take more than an hour per week and it will be well worth it. Spend some time each week finding and connecting with people in your market on Facebook, Twitter and any other sites you may already be a part of. Use search terms related to your niche and add new people as friends. 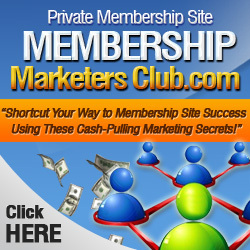 This will help build your circle of influence and get potential new members to your site.